In 1893, Swami Vivekananda arrived in America as an anonymous and penniless sannyasin (wandering monk). He had travelled to America as a representative of Hinduism and the ancient Indian tradition of Vedanta. Yet Vivekananda was not bound by any formal ties of religion; to the World Parliament of Religions he offered a message of a shared spirituality and the harmony of world religions. This universal message and his dynamic spiritual personality won the hearts and minds of many seekers; and his vision is still treasured today. Vivekananda was born to an orthodox Hindu family in Bengal 1863. From an early age, he displayed signs of great compassion and also the qualities of a natural leader. Vivekananda had a sharp intellect and devoured literature from both East and West – this included Western philosophy and the great English poets. Vivekananda particularly liked the rational reasoning of the West and was easily dismayed by many of the religious superstitions and the cultural decline that Indian society found itself in. From this background Vivekananda was drawn to join the Brahmo Samaj. The Brahmo Samaj was a modern Hindu movement who sought to revitalise Indian life and spirituality through a rationalistic approach and abandonment of image worship. However the rationality of the Brahmo Samaj could not satisfy the latent spiritual hunger of Vivekananda. From an early age he began to have spiritual experiences and, at the age of 18, he felt an overwhelming desire to ‘See God’. 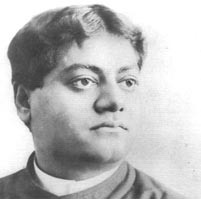 With a directness that was typical of Vivekananda he asked those around whether they had seen God. All affirmed in the negative. This included the great Devendranath Tagore (father of Rabindranath Tagore) However Devendranath told Vivekananda that he saw in him the eyes of a yogi and surely he would realise God in this lifetime. Although none could satisfy his question, he came to hear of the name Ramakrishna Paramhansa who was reputed to be a great spiritual personality and someone who had realised God. Ramakrishna instantly recognised the spiritual potential of Vivekananda and lavished attention on Vivekananda, who at first did not always understand this. In the beginning, the reasoning mind of Vivekananda was sceptical of this God intoxicated Saint, and Vivekananda would frequently question and debate his teachings. However, the spiritual magnetism of Sri Ramakrishna soon melted Vivekananda’s heart and he began to experience the real spirituality that Ramakrishna exuded. Thus Vivekananda’s mental opposition faded away to be replaced by an intense surrender to the Divine Mother and a burning longing for realisation. After the passing of Ramakrishna, the other disciples looked to Vivekananda for leadership and he helped form the first monastic order of Ramakrishna. Under his constant guidance he urged his fellow brother disciples to renounce the world and seek communion with God. However, for Vivekananda, personal liberation was not enough. His heart ached for the downtrodden masses of India who suffered poverty and many hardships. Vivekananda felt that the highest ideal was to serve God through serving humanity. Thus Vivekananda would later add social work as an important element of the Ramakrishna order. Thus after spending a few years in meditation Vivekananda began travelling throughout India, visiting many of the holy sites. After travelling through India and coming into contact with many influential figures, it was suggested that Vivekananda would make an ideal candidate to represent Hinduism at the World Parliament of Religions which was shortly to be held in Chicago, USA. Before leaving Vivekananda went to receive the blessings of Sarada Devi, the wife of Sri Ramakrishna. After receiving her encouragement and blessings he made the momentous journey to America dressed in his ochre robe and maintaining the vows of a Sanyasin. Vivekananda – World Parliament of Religions. Swami Vivekananda was chosen to represent Hinduism. However Swami Vivekananda did not try in any way to prove the superiority of his religion. Instead Vivekananda spoke with great sincerity about the harmony of world religions and the common spirituality of humanity. It was this universal message of oneness which captivated the audience. The New York Herald said of Vivekananda. The Boston Evening Post said. Throughout the conference Vivekananda was undoubtedly the star, the organisers would save Vivekananda to the end to make sure the audience would stay to listen. The conference propelled Vivekananda into the public eye and for many months he travelled across America giving talks on the ancient tradition of Vedanta and his hope of fusing the spirituality of the East with the materialism of the West. After several years in the West, Vivekananda returned to India where he was met with a rapturous reception. In particular, his brother monks who were full of pride with Vivekananda who had returned with glowing praise. Despite failing health, Vivekananda threw himself into a whirlpool of activity reorganising the monasteries and exhorting his fellow Indians to return to the truth of the Vedantic principles. Vivekananda also sought to imbibe in the Indian consciousness a renewed dynamism to improve their material life. As Vivekananda often said, it was no use teaching religion to those with empty stomachs. Swami Vivekananda had a great love for India. As well as teaching the benefits of selfless service and encouraging greater dynamism, he also never lost sight of the ultimate goal in life, which was to become one with God. Vivekananda passed away at the young age of 39 but he achieved a remarkable amount in this short time on earth. He combined the ancient spiritual traditions of India with the dynamism of the West. Many Indian politicians would later offer their gratitude to the impact and ideals of Vivekananda. To many Vivekananda is regarded as the patron saint of modern India. Towards the end of his life, Vivekananda retreated from public service and contemplated the vaster meaning of life. 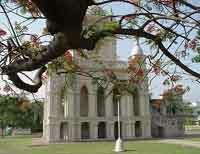 Swami Vivekananda’s temple at Belur Math where he was cremated. Article Citation: Tejvan Pettinger, Biography of Swami Vivekananda, Write Spirit, updated 12th Jan. 2011.